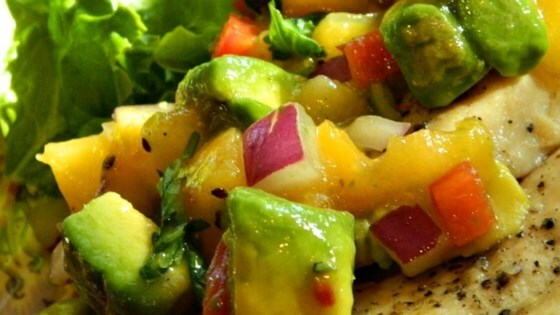 "Fresh peaches with creamy avocado, bell pepper, onions, and jalapeno make a great summertime salsa. Use as a topper for grilled fish or chicken, or just dip tortilla chips in it. Not a fan of avocados? The salsa is just as great without it. The longer it can marinate, the better it is." Gently mix peaches, jalapeno pepper, red onion, red bell pepper, cilantro, garlic, lime juice, and lemon juice in a bowl; season with salt and black pepper. Cover bowl with plastic wrap and refrigerate at least 30 minutes. Fold avocado into the salsa to serve. Amazing. I used Thai chili sauce since I didn't have a jalapeño. It worked very well. Everyone raved about it. I served this over grilled chicken - amazing!